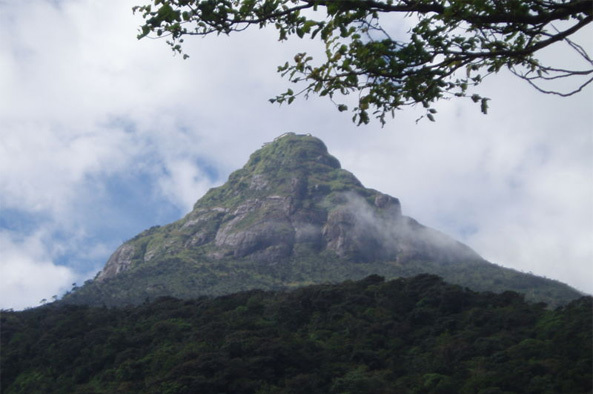 At 7,360 feet, Sri Pada is the second highest mountain in Sri Lanka, and its symmetrical shape and the prominence with which it rises out of the Central Mountain massif has inspired awe for centuries. Sri Pada plays a pivotal role in the origin story of Sri Lanka’s indigenous inhabitants, the Veddha, also known as the Wanniyala-Aetto. According to the story, around the 5th or 6th century B.C., Prince Vijaya traveled from India with hundreds of followers to the island of Sri Lanka and set up rule over the local people through marriage to Kuveni, a local demon-worshiping princess. When Vijaya rejected Kuveni for an Indian princess, their two children moved to the region around Sri Pada, in south-central Sri Lanka. Their descendents are the Veddha, who are now outnumbered by the dominant Sinhalese people and the larger minority group of Tamils. To the Veddha, the mountain is known as Samanala Kanda after the guardian god Saman. The Buddhist Sinhalese and the Hindu Tamils each have their own connection to Sri Pada. Buddhists regard the footprint as Buddha’s, hence its name Sri Pada, “holy footprint.” The Hindus believe that while dancing to create the world, the god Shiva left his footprint; thus for them, the mountain is Sivanolipatha Malai (Lord Shiva’s Footprint on the Mount). Muslims believe that the mountain is where Adam stood on one foot after being cast out of the Garden of Eden. One tradition suggests that God put Adam there because it was as close to heaven as he could get. Some Christians also believe the footprint is that of St. Thomas, who is credited with bringing Christianity to Sri Lanka. After fighting in India circa 324 B.C., Alexander the Great is believed to have gone to Sri Lanka and climbed Sri Pada. Another early historic ascent was that of the Indian Buddhist master Vajrabodhi in the 7th century. Regular pilgrimages have been recorded at Sri Pada beginning in the 11th century when King Vijayabahu climbed the mountain and encouraged local villages along the route to provide services to travelers. In the 13th century, a local king installed iron chains to help pilgrims make the final phase of the climb; these simply swung loose from a fixed point at the top, and if the winds were heavy, people could die, as the chain would fling them against the mountain. Later a staircase and railings were erected on another side of the mountain to make the climb easier. In 1947, a Sri Lankan travel minister is supposed to have made a deal with the god Saman that if he helped with a hydroelectric project for the city of Colombo, the government would install lights along the staircase, which it did in 1950. While the Veddha have been living away from the Sri Pada area for several generations, their religious heritage has intermingled with the dominant Buddhist and Hindu faiths in their reverence for the sacred mountain forest. Buddhists believe that Saman has protected the footprint ever since Buddha’s visit, and that the two figures cooperate to care for the mountain. A shrine to Saman exists alongside the famed footprint; Buddhist temples also surround the mountain and monks go to caves within it to pray. Such sacred places illustrate the way spiritual traditions can layer over one another, and the continuity gives a sense of power to the associated land formation. Currently the mountain sees up to 3 million pilgrims and other climbers each year. They are permitted to climb from December to May (the dry season), and typically start their journey at Ratnapura, “the City of Jewels,” near a Saman temple. Along the route, pilgrims often bathe at the mountain stream known as Seetha Gangula to purify themselves. It is traditional for pilgrims to wear white clothing and sing religious songs while climbing. Along the way, many stop to hang a threaded needle onto a shrub where it is said that Buddha stopped to mend his garment. Pilgrims typically climb in the early morning hours to arrive at the top by dawn, and when they get their first glimpse of the summit, they add a pebble to a rock cairn along the pathway. At the top, when the sun rises, Sri Pada casts a spectacular shadow on a nearby mountain. Some pray and chant, while others snap pictures. Pilgrims ring a bell for each time they have ascended. The forest that surrounds Sri Pada is equally revered. It is known as Samanala Adaviya, after the god Saman, but locals frequently refer to it as “Excellency,” reflecting their sense of the landscape as a living being that provides for them. Certain trees are thought to be the homes of deities and thus are never allowed to be cut. Water that runs through the forest provides for millions of people and is considered holy. Nonresidents are not permitted to extract resources from the forest, and residents must comply with extensive restrictions on harvesting. The ecosystem provides inhabitants with not only wood but also nontimber products that are used for food, tools and medicine. The older generations pass on guidelines for how and when to harvest resources, and residents always ask Saman for permission. Some areas are marked off limits, or guidelines change with the seasons. Penalties for breaking these rules are severe and stories abound of people who became ill or lost for violating the rules. In addition to its spiritual importance, Sri Pada’s surrounding mountain forest is part of the country’s valuable forest ecosystem. The watersheds of four major rivers, the Kelani, Kalu, Walawe, and Mahaweli, are in the forests of Samanala Adaviya. Sinhalese kings started an early tradition of conservation in the country when they began to donate forestland to Buddhist monasteries for protection. These monasteries have remained important guardians for Sri Lankan forests. Samanala Adaviya has remarkable biodiversity: over 640 medicinal plants alone have been recorded. The terrain is dense with canopies of plants, hanging vines, bamboo trees, streams, bright flowers and boulders covered with moss. Its humid tropical forest acts as a climate regulator, replenishes water and keeps the nearby soil fertile. It is home to 14 endangered, endemic bird species, as well as rare leopards, elephants, amphibians, insects and fish. The Sri Lankan Department of Wildlife Conservation now manages the area under the designation of the Peak Wilderness Sanctuary, which was formally established in 1940. As state-controlled wilderness areas have begun to replace Sri Lankans’ longstanding faith-based conservation system, conflicts have arisen. These are based in the fundamental contradiction between centralized regulation that prioritizes wilderness preservation above all else, and locally controlled regulation that sees religious beliefs and environmental protection as mutually interdependent. The first sanctuaries in Sri Lanka, established by 19th-century British colonial rulers, were primarily designed for game hunting. In this history lies the root of the problem: Their priority as reserves prevented sustainable, daily interaction between humans and the land of the sort that evolved among the indigenous people. This problem continues today, as the Veddha are restricted from parts of their homeland that have been declared sanctuaries and their hunting is limited. There is also a clash between the hunting-based society of the Veddha and the Buddhist prohibition against killing living creatures. Hunting aside, federally controlled reserves are often not regulated in cooperation with the local community. Thus they do not take advantage of the practices honed over centuries, and the local community has little say over policy decisions. The enormous numbers of pilgrims who climb the mountain and stay in facilities in its foothills continually threaten to overwhelm the land’s resources. Non-biodegradable garbage is a major problem, with both travelers and vendors throwing plastic bags, food wrappers and other trash over cliffs all over the mountain. Visitors describe the atmosphere at the base of Sri Pada as similar to a fairground; vendors sell souvenirs, incense and snacks, and recorded music plays. Such commercialism is inevitable at a major destination; however, development to accommodate pilgrims is endangering the forest around the mountain and some species that live within it. A greater permanent population near the mountain is also increasing the rate of deforestation because of the need for firewood. Nationwide, human settlement has reduced Sri Lanka’s forest coverage from 80 percent in 1881 to 22 percent in 1996. The Upper Watershed Management Project (UWMP) works for the health of the four river watersheds in the forest around Sri Pada. In 1998, international development funds initiated the project with a goal to combat soil erosion and resultant flooding and low crop production. The UWMP works in a participatory manner with local residents to encourage tree planting and develop sustainable farming practices. Recently the UWMP also worked with the Department of Wildlife and local government to ban plastic bags. A 2003 report indicates many merchants are cooperating, either because of their own reverence for Sri Pada or because they know that their livelihood depends on the mountain. Signs remind travelers that their visit is “not a joy ride but a pilgrimage” and to “Surakimu parisaraya – Samanola kandu piyasa” (Protect the environment – the hills of Samanola range). Attendees at the 1998 proceedings of the UNESCO World Heritage Forest Program listed Sri Pada as a possible candidate for inclusion on the World Heritage Forest list. In 2006, the government of Sri Lanka listed the area on its tentative list for possible nomination to the World Heritage Site list under the name “Peak Wilderness Sanctuary.” The challenge for Sri Pada is to balance religious beliefs, local resource practices and environmental preservation, writes Anoja Wickramasinghe. Sri Pada is an important example of both traditional conservation practices rooted in religion, and in the ability of various faith traditions to worship sacred land side-by-side. In a nation that has been torn apart by ethnic conflict as Sri Lanka has, the multifaith sacred mountain is a powerful symbol. This peak, revered by more major religions than any other on earth, should galvanize people to work together for a sustainable and locally based management program. Gray, Martin. “Adam’s Peak, Sri Lanka.” Sacred Sites: Places of Power. Asian Development Bank. “ADB Loan to Sri Lanka for Upper Watershed Management Project.” News release, September 24, 1997. Bernbaum, Edwin. Sacred Mountains of the World. Berkeley: University of California Press, 1998. Fernando, Vimukthi. “Sri Pada Clean Up: An Uphill Task for Environmentalists.” Sunday Observer, February 16, 2003. Gabriel, Cath. “A Spiritual Journey to a Footprint in Rock.” Canberra Times, August 15, 1999. Gunawardena, Elgoda Ranawakage Nimal. “Evolution of Watershed Management: The Sri Lankan Experience.” In Preparing for the Next Generation of Watershed Management Programmes and Projects, edited by Achouri, M.. et al. (Proceedings of the Asian Regional Workshop on Watershed Management,11-13 September 2003, Kathmandu, Nepal). Kathmandu, Nepal: Forest Resources Division/ International Centre for Integrated Mountain Development, 2005. Nanayakkara, S. S. M. “Visit of Alexander the Great to the Sacred Mount of Sri Pada – Fact or Fiction?” The Island Saturday Magazine, January 4, 2003. Partridge, Frank. “The Highway to Happiness: Pilgrims Cross the World to Conquer the Summit of Adam’s Peak, Watch the Sri Lankan Sunrise and Pray.” The Independent, May 26, 2001. Patry, Marc. “Forest Protected Areas Warranting Further Consideration as Potential WH Forest Sites: Summaries from Various and Thematic Regional Analyses.” (Compendium produced from the proceedings of the 2nd World Heritage Forest meeting, held at Nancy, France, March 11-13, 2005). United Nations Educational, Scientific and Cultural Organization. “Peak Wilderness Sanctuary.” UNESCO World Heritage Centre. “Wanniyala-Aetto.” Survival: The Movement for Tribal Peoples. Wickramasinghe, Anoja. “Adam’s Peak Sacred Mountain Forest.” In Proceedings of the International Workshop on the Importance of Sacred Natural Sites for Biodiversity Conservation. Held in Kunming and Xishuangbanna Biosphere Reserve, People’s Republic of China, February 17-20, 2003. Paris: UNESCO, 2003.